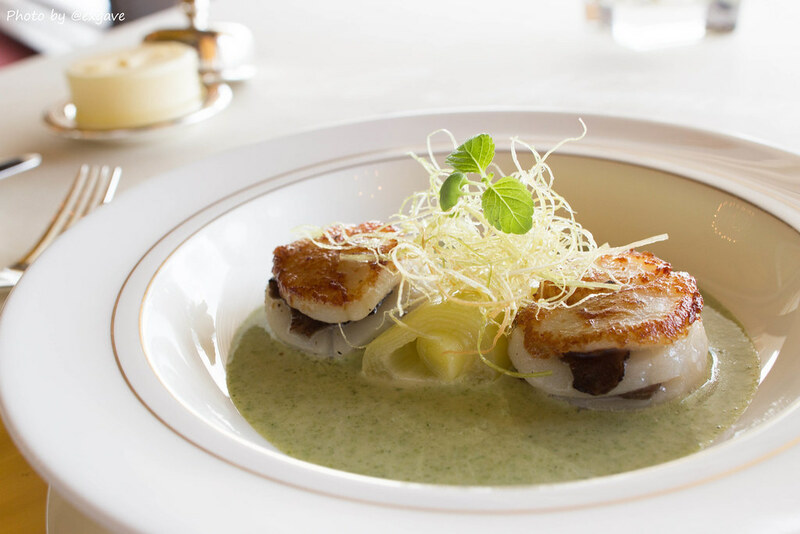 Over decades, Le Normandie, the flagship French restaurant in Thailand, still maintains its finest French haute cuisine. 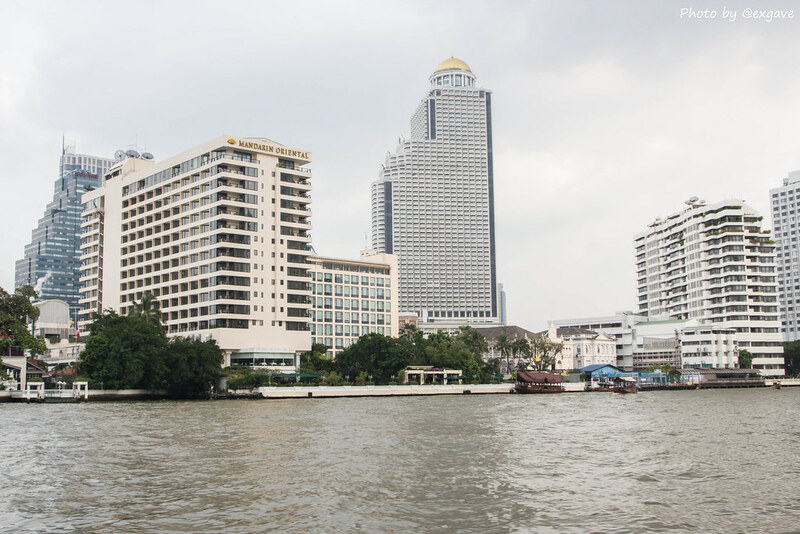 The gorgeous view of the Chao-Phraya River, luxurious decorations, magnificent cuisines, with one of the finest wine list and top-notch services illustrates a picture of Le Normandie. 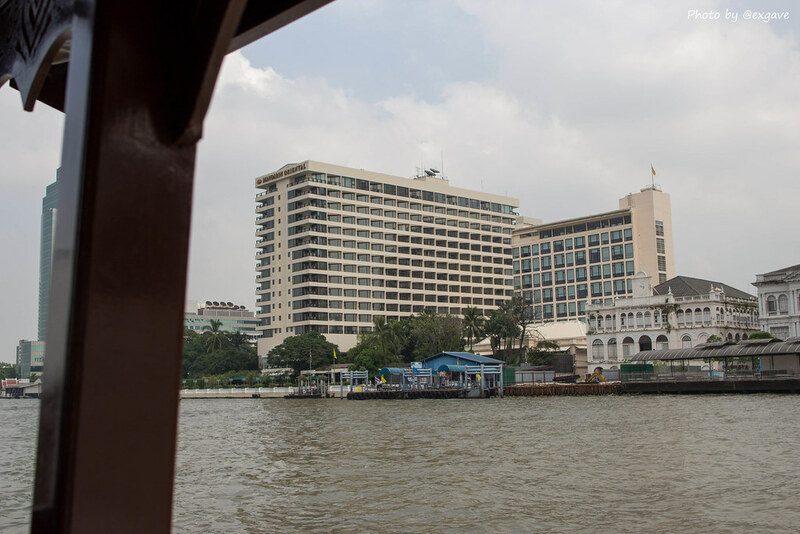 Le Normandie is located at the Mandarin Oriental Hotel, Bangkok. 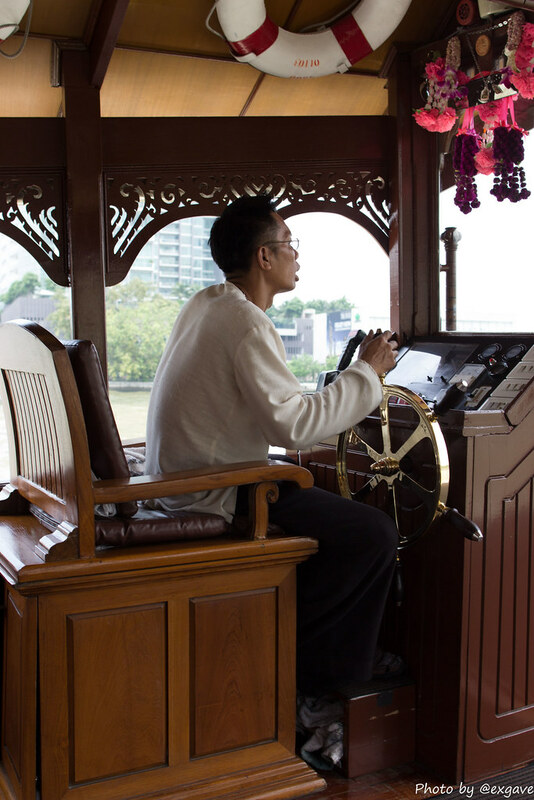 In my opinion, the most convenient way to travel here is by MO’s ferry that will take you from the Sathorn pier, a few blocks away from BTS Saphan Tak Sin station – chic’ and classy indeed. 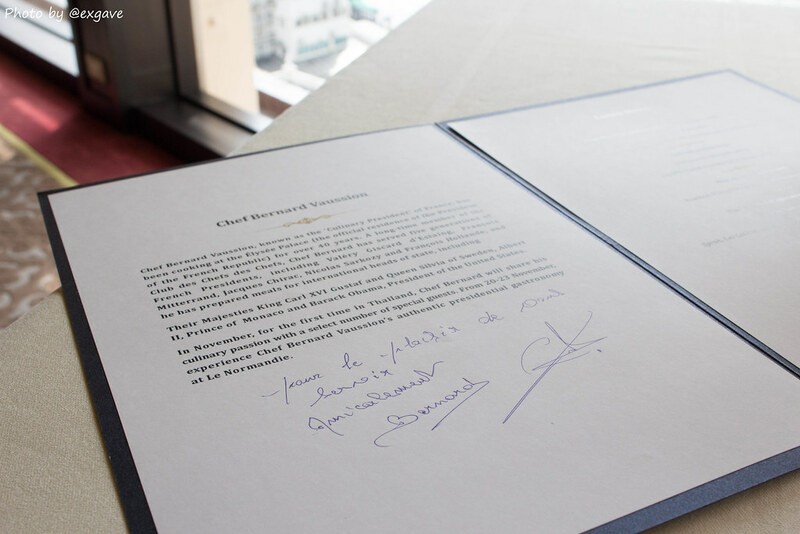 Between the twentieth to the twenty-third of November, 2013, Le Normandie invited a special guest chef from the French Presidential Residence, Chef Bernard Vussion, to perform his authentic presidential cuisine here in Thailand. There are two selections; lunch and supper. 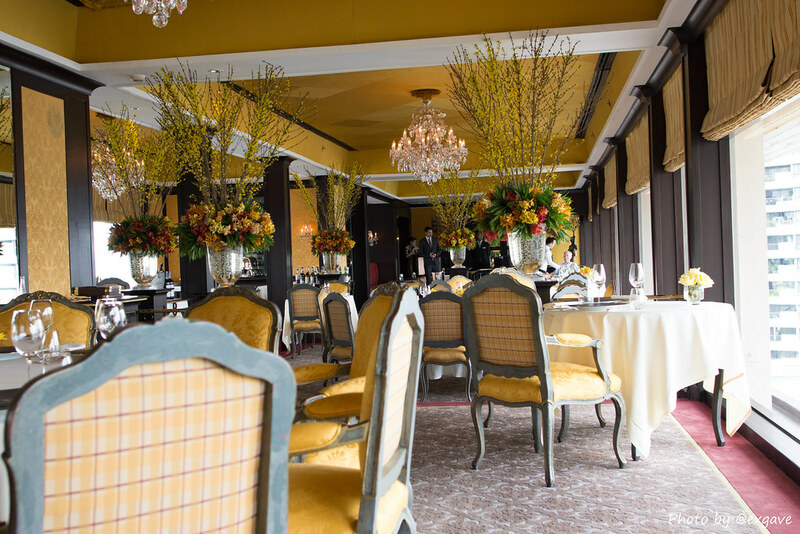 For me, of course, I would go for a lunch set, which includes 5 courses of meals, desserts, and tea. 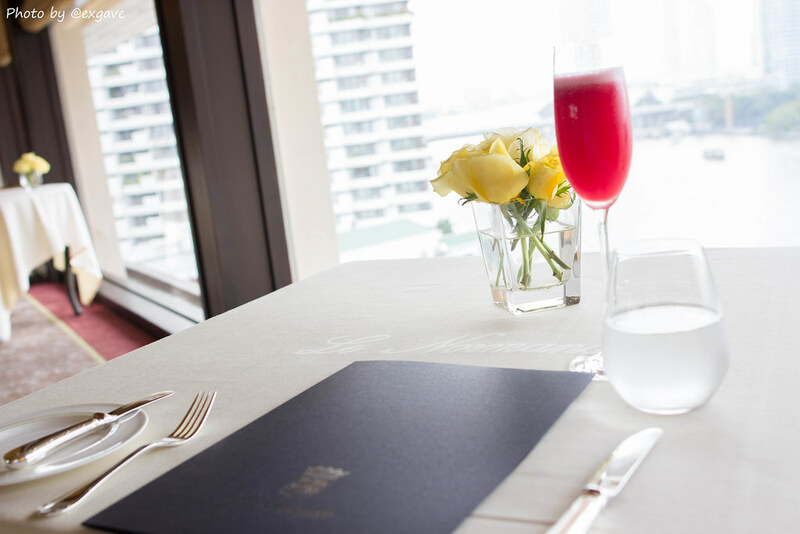 The price of this marvelous lunch is 2950++ THB. Booking is made in advance. 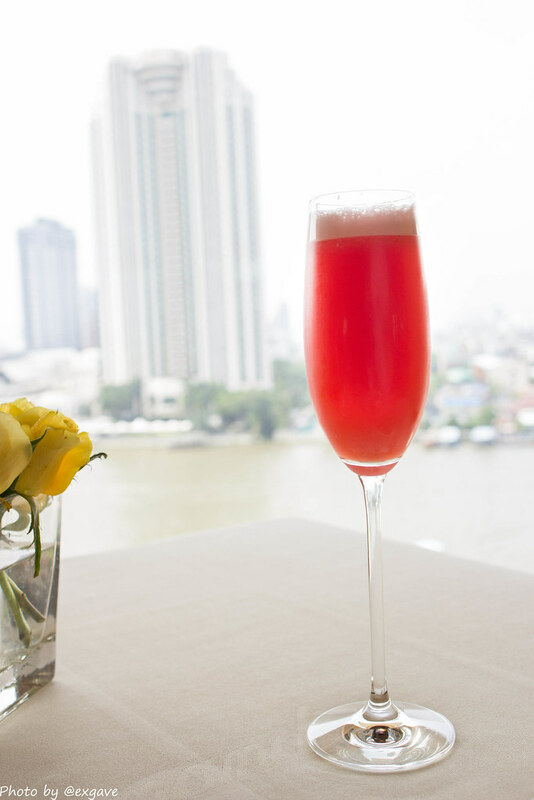 Prior to the main courses, I was served with a complimentary drink, a fruit punch; it was of savory and refreshing taste. Then, bread was chosen for me by Khun Teerachai. 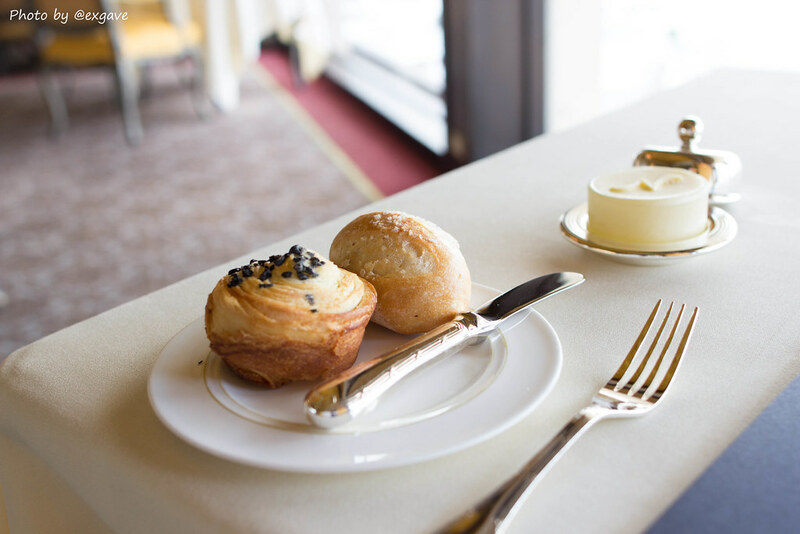 Le Normandie’s signature bread, salted bread, and croissant-like bread were well selected by him. Both of them were of fine taste. I especially love the croissant-like one. 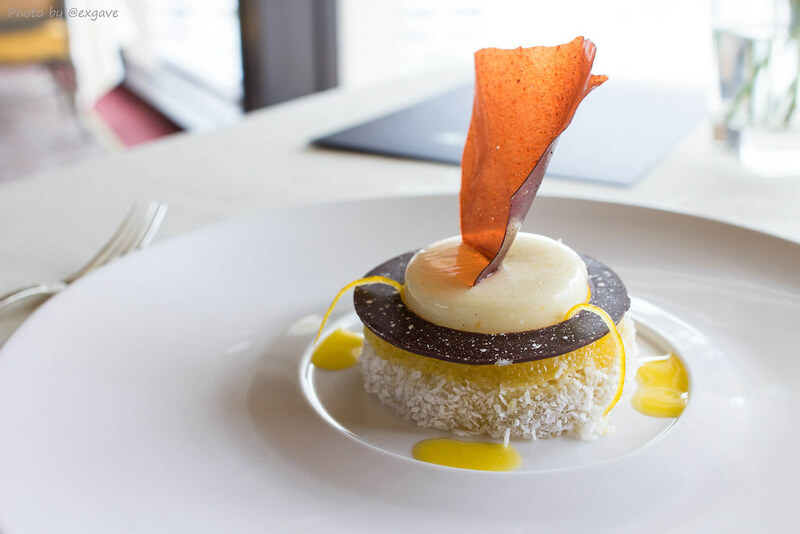 To begin the course, a mille-feuille of scallops and truffle was served as a first starter. The cream sauce was made of parsley, I suppose. It matched fabulously with the scallops. Truffle gave this dish another dimension of aroma which was pleasant. 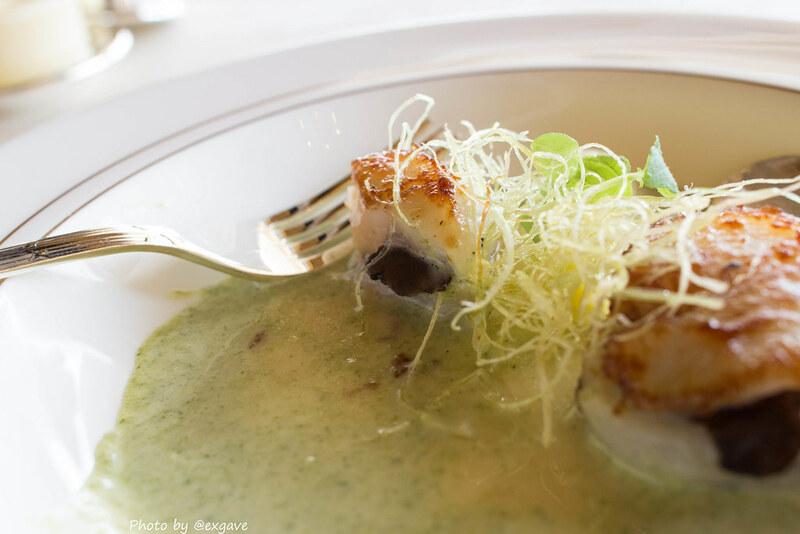 Leek also improved the texture of scallops. The second starter was foie gras in light puff pastry. The stuffing inside was foie gras, truffle and bacon. The dough was puffy and tasty. Foie gras was well cooked. 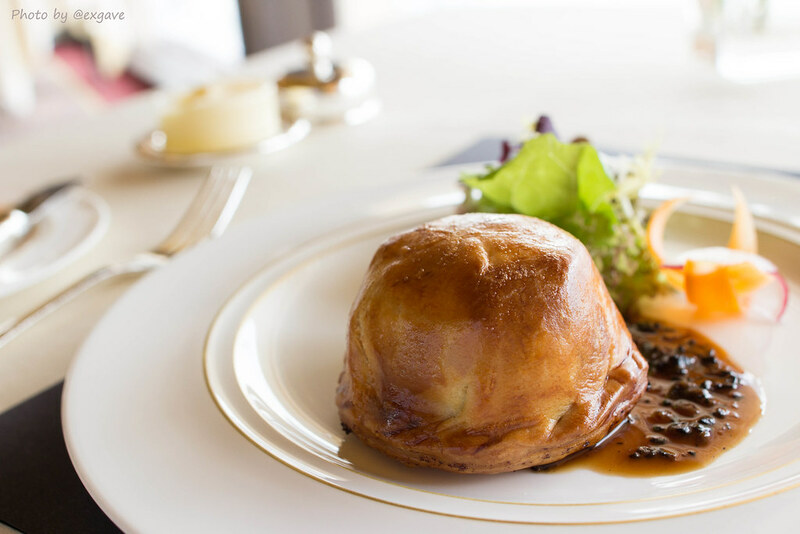 The gravy which was made from truffle combined perfectly with pastry and the stuffing. Bacon did not seem to improve the texture of foie gras. Anyway this was still a very fine plate after all. 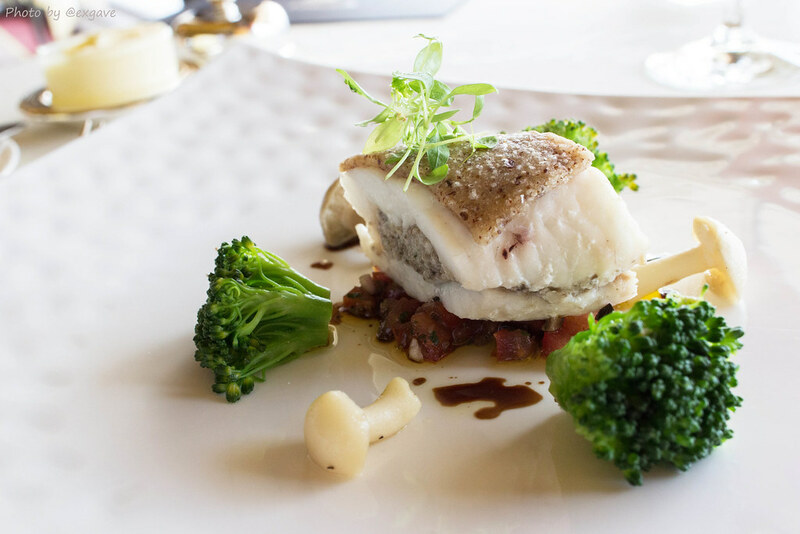 The fish dish, of poached fillet of dover sole with mushrooms and shallots, was served accordingly. This may be my least favourite dish because I am not quite fond of fish dishes, well, except for sushi><. Nonetheless, this dish was still a splendid one. Tomato stuffing gave the dish its sourness and freshness. Also, the shallots did not give a too strong scent, which completes the demands for people, some of which are not fond of the scent. 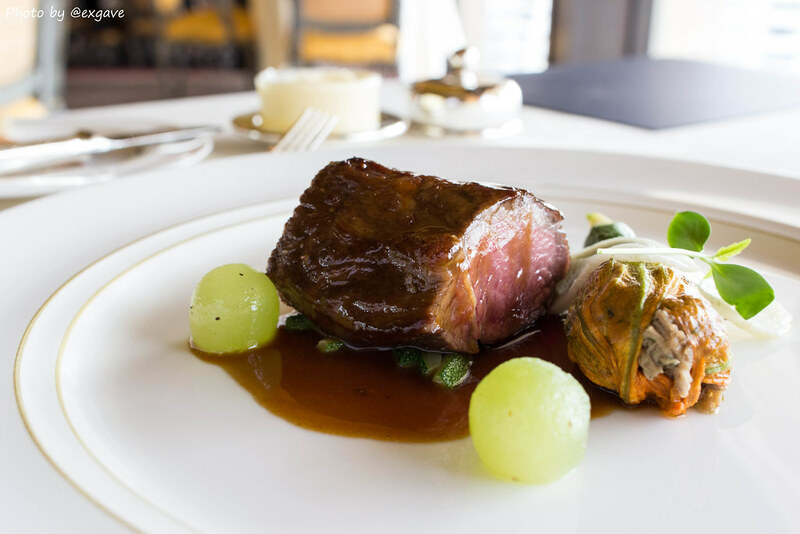 As a sequel to the course was roasted loin of lamb with artichoke. The lamb was so tender and flavourful. The gravy was magnificent but slightly salty for my liking. Zucchini and the stuffing inside its flour gave this dish another dimension of texture and flavour. 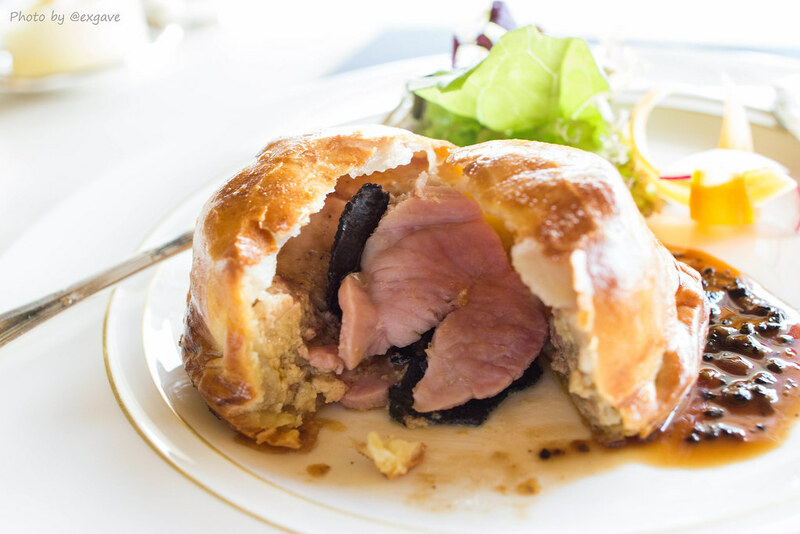 The sweetness of grapes balanced out the strong and flavourful gravy. The presentation was gorgeous indeed. 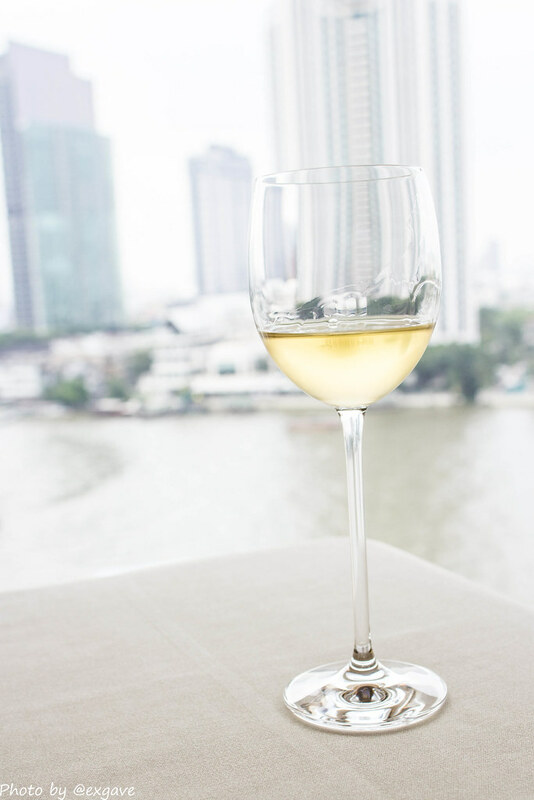 To couple this dish, Khun Teerachai brought me a glass of Domaine Ponsot Morey St. Denis Cuvée des Grives, 2001, which was a medium body wine, so complex and long finishing, filled with the scents of berries, cherry and plum. It did the job perfectly. Last but not least, rich almond cake, scented with orange was served. This was one of the most elegant dishes I have ever had. It had a very lovely presentation. 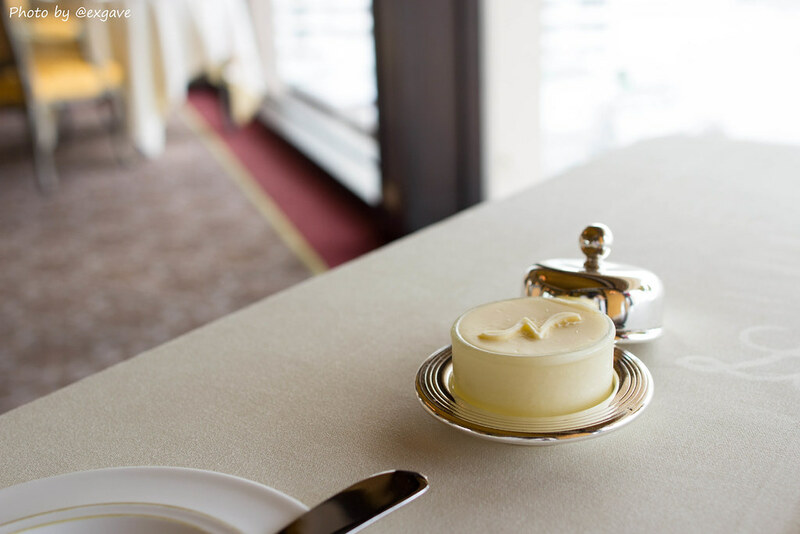 An orange mousse on top of it was smooth and delicious. 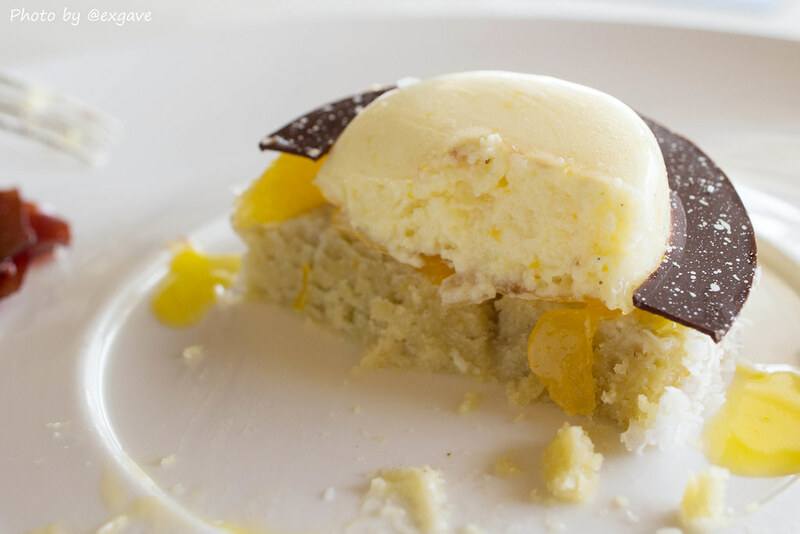 The sourness of orange and apricot balanced the sweetness of the almond cake and the scent of orange made this dish so refreshing and light. This one is my favourite among the 5 courses. 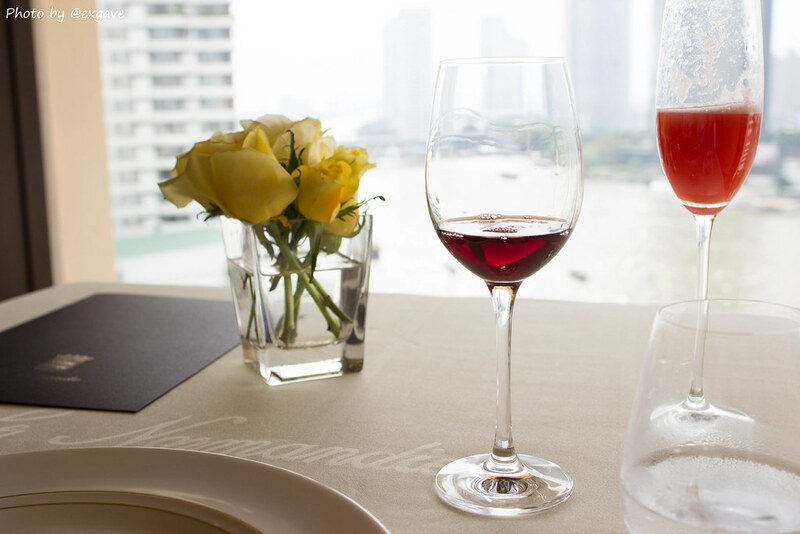 During this last course, Khun Teerachai introduced one of the sommeliers to me, Khun Banyat. 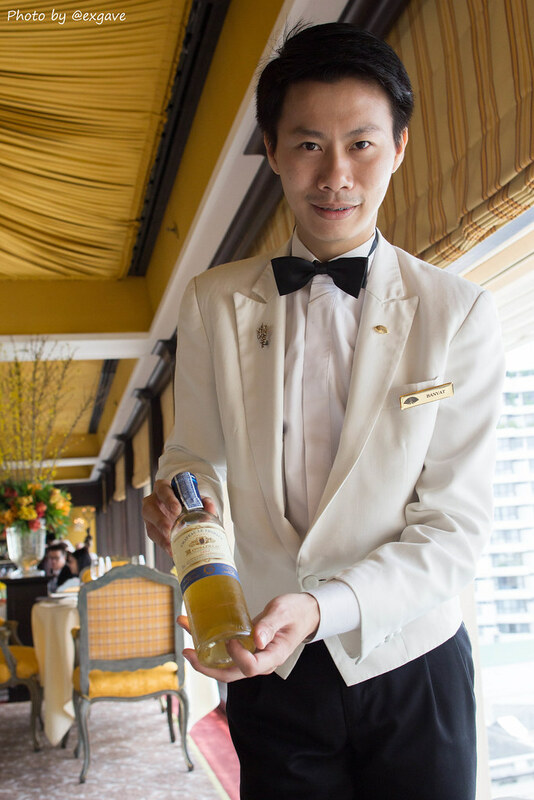 Khun Banyat well selected a glass of dessert wine which was Chateu le Thibaut Monbazillac, 2009. 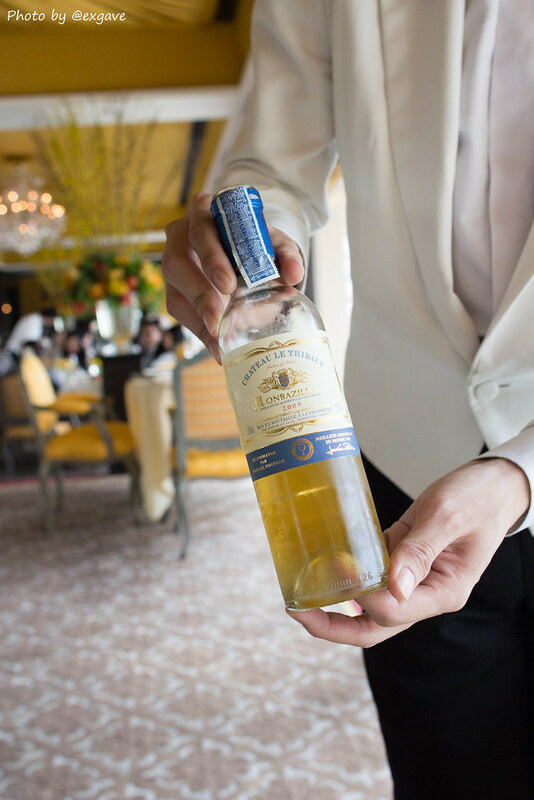 A scent of honey, peach and a bit of citrus fruits burst on my palate. Nice finishing and freshness. What a decent dessert wine it was. 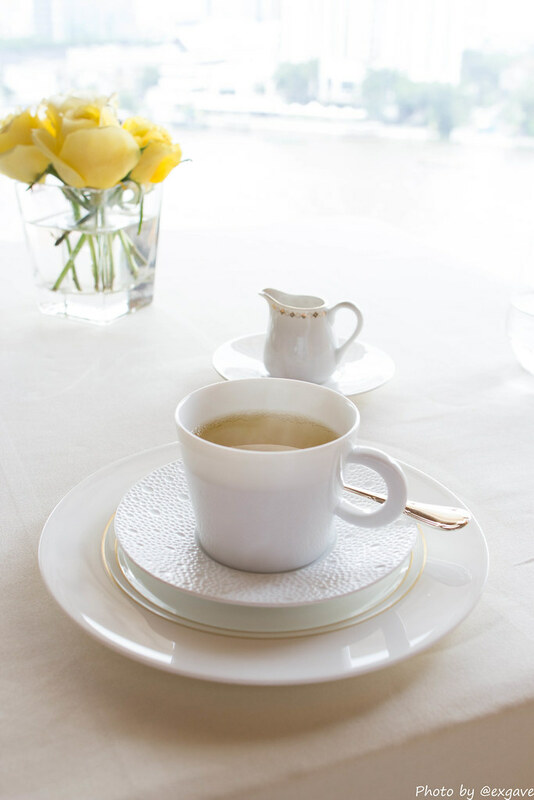 To end the course, I chose a cup of peppermint tea which was so pleasant. So peppermint><. A very well brewed tea, I have to say. 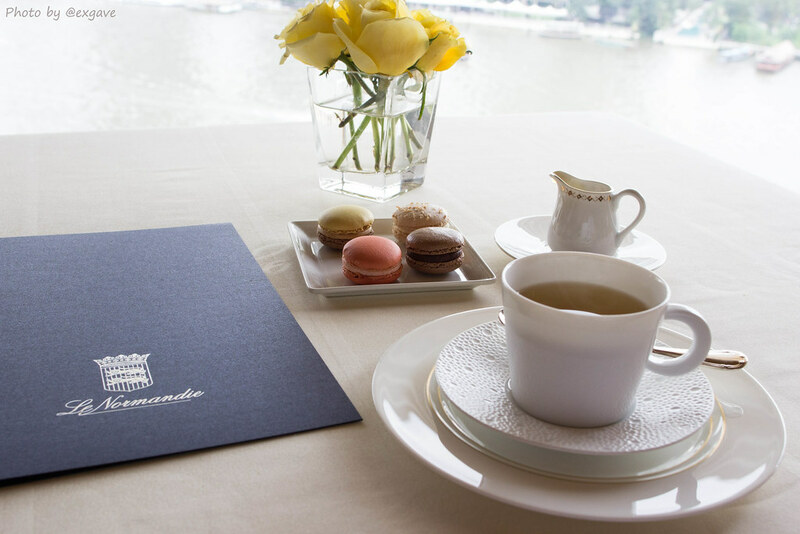 A cup of tea came along with Mandarin Oriental’s signature sweet, macarons, freshly made from MO’s bakery. 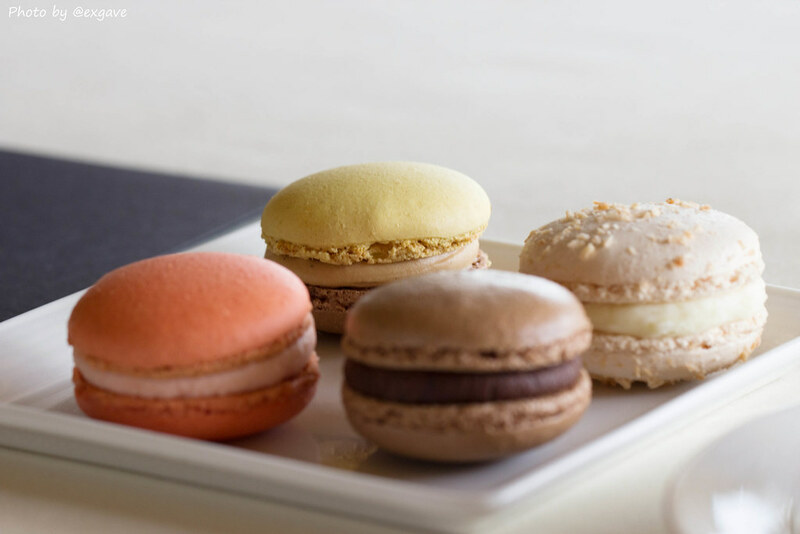 It was made to order; each and every piece of macarons in Le Normandie will be guaranteed its delicacy. Chef Bernard Vaussion was skilful, polite and friendly. 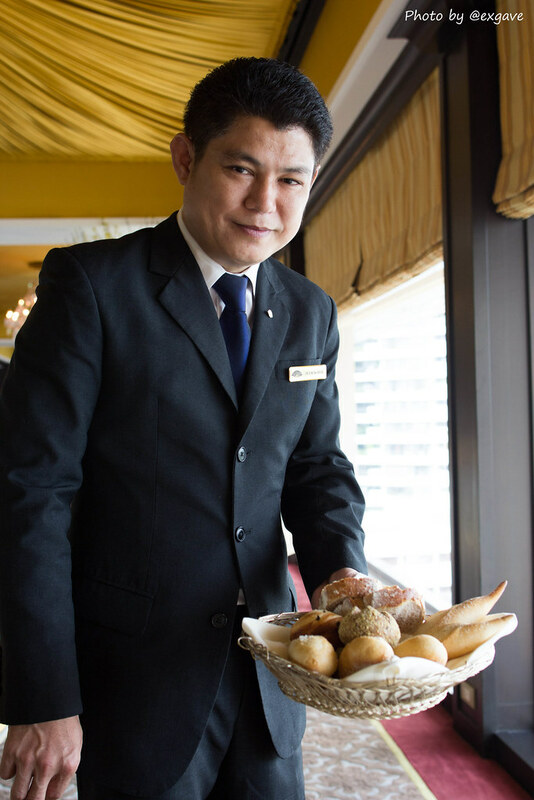 Le Normandie’s staffs, especially KhunTeerachai and Khun Banyat were helpful, polite, knowledgeable and friendly. This was one of the most remarkable and memorial experiences in my life. 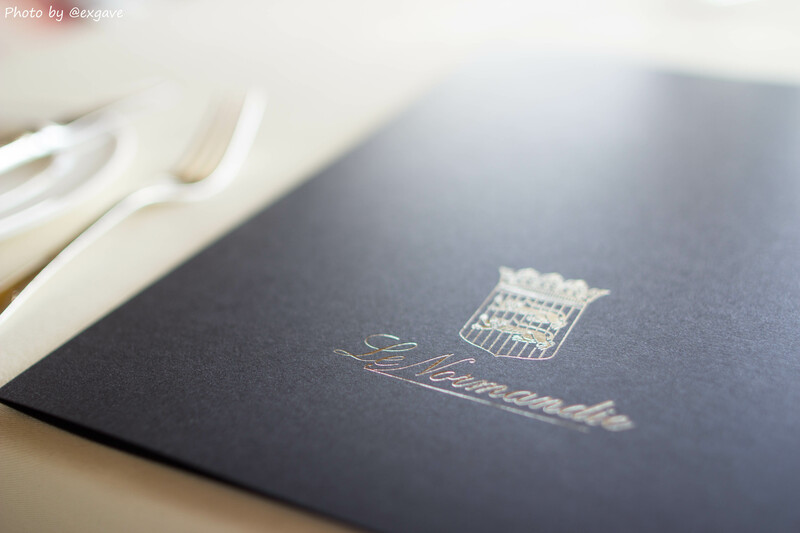 Le Normandie surely deserved the flagship of French cuisine restaurant in Thailand. I should find some time to visit this locale more frequently.